Dracupyr has an elusive yet commanding presence, however, few are witness to it before their end. It watches from the shadows for unaware prey and when the moment is right, reveals itself and takes down the unsuspecting victim. Dracupyr draw in lesser monsters, stunned and enchanted by their silent, powerful demeanor, which lulls the prey into believing Dracupyr may protect them, however, the reclusive beast draws its wing over its face and licks its teeth as the prey wanders dreamily into the lair by their own volition. Screams of horror from its prey simply won't do - as it could scare off other potential victims. 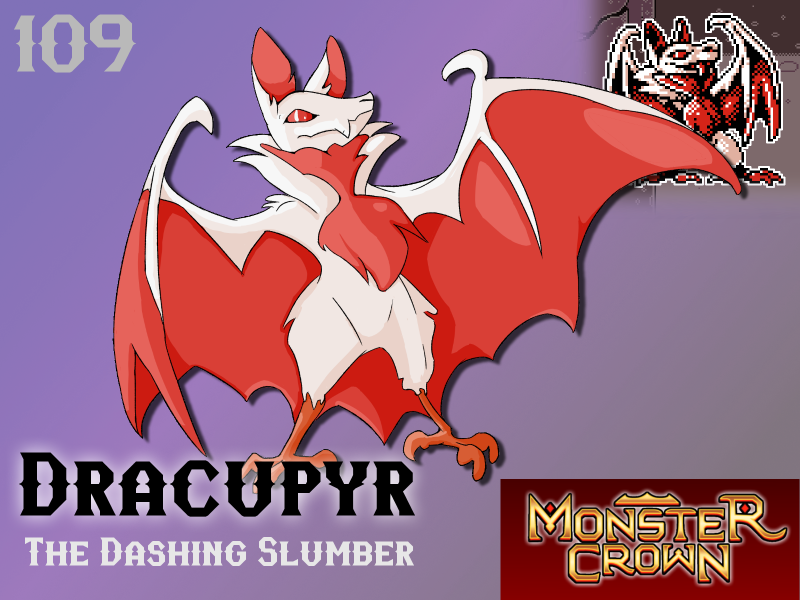 Thankfully for Dracupyr, its saliva acts as a powerful sleep agent, and in a bite, causes its victims to fall into a gentle but deep slumber, one from which they will never awake as the monster begins feasting. It rarely meets humans, but it seems to recognize that tamers have a similar commanding power over monsters. Fascinated, it seems torn on whether to kill humans, or to study their mysterious power. One should tread carefully around this dashing beast - it has its own motives, and many have fallen victim to its charms - as well as its sleep-inducing bite! Will Dracupyr make your team? Not my cup of tea, but I got a couple pals that I bet would love to have this dude on their side.